Urns, side arms & clappers, cast components, angle bars, etc. Wood & pressed wood rosettes, corners, top pieces, etc. Use to level clocks, furniture, appliances, etc. Description: 1-1/4” W x 3-5/8” T approx. Length does not include mounting peg. Not manufactured to specification but still usable. Regularly $2.50. While supplies last. Description: Antiqued Brass Plated Key. 2-15/16" long. 1-5/8" shaft length. 1-11/32" head diameter. 7/16" long flange length. 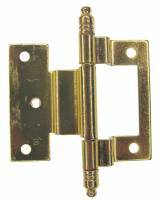 Description: Bright brass plated steel lock with a lock plate. Used on floor & wall clocks & other fine furniture. #33727 key fits this lock & must be purchased separately. China. Description: Polished brass. 3/4” tall x 3/4”diameter. 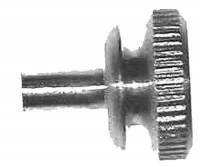 With mounting screw. Description: Bronze finish on cast pot metal. 3/4” tall x 3/4” diameter. 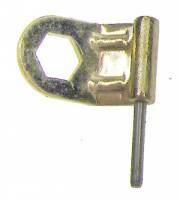 With mounting screw. 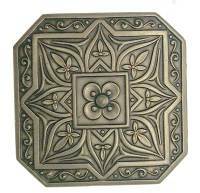 Cast Bronze Finish Escutcheon 5-1/8" x 7/8"
Description: Cast pot metal with antiqued brass finish. 2” W x 1-1/2” T x 3/8” D. Glue to affix. Regularly $4.50/each. While supplies last. 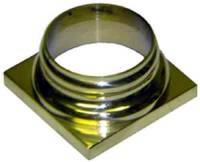 Description: Cast brass for 1/2" diameter columns. 1/2" high. Made in India. 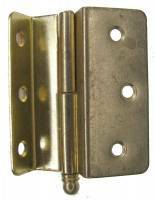 Description: Nickeled lock measures 13/16” W x 2-3/4” T x 5/16” deep with extended key sleeve to fit 7/8" and thicker doors. Standard H. Miller keys (#29309, #23933 or #23934 will work with this lock. Regularly $4.00/each. While supplies last. Description: Brass plated steel. Used on floor and wall clock cases and other fine furniture. Dimension shown is overall length. China. Description: Brass plated steel. 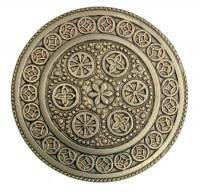 Used on floor and wall clock cases and other fine furniture. Measures 15/16" W x 1-9/16" L (24mm x 40mm). China. Description: Brass plated steel. Used on floor and wall clock cases and other fine furniture. 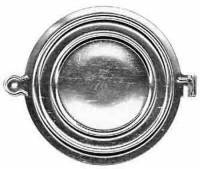 Measures 1-1/16" W x 2" L (27mm x 50mm). China. 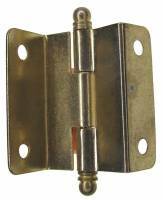 Description: Brass plated steel. 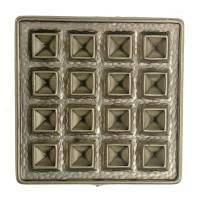 Used on floor and wall clock cases and other fine furniture. Measures 1-5/16" W x 2-5/16" L (34mm x 60mm). China. Description: Brass plated steel. 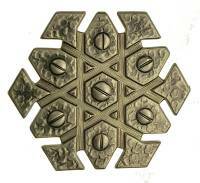 Used on floor and wall clock cases and other fine furniture. Measures 1-7/16" W x 2-3/4" L (37mm x 70mm). China. Description: 5” x 10” x 3/16” plywood. 3 countersunk holes. With 3 screws. 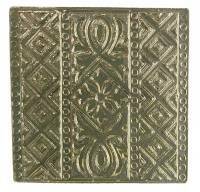 Description: Stamped brass with antiqued finish. 36mm square x 7mm thick (1-3/8” x 9/32” approx). Affix with glue. Regularly $5.00/each. While supplies last. Description: 46mm x 70mm legs (1-13/16” x 2-3/4” approx) x 4mm (5/32”) thick. Affix with glue. Regularly $12.50/pair. While supplies last. 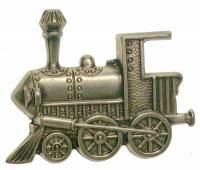 Description: Finely detailed locomotive. 20mm T x 25mm W x 1.6mm thick. Glue to affix. Regularly $2.50/each. While supplies last. Description: Antiqued brass. 100mm W x 37mm T x 1.3mm thick. Glue to affix. Regularly $4.50/each. While supplies last. Description: Antiqued brass. 40mm W x 35mm T x 1.2mm thick. Glue to affix. Regularly $3.00/each. While supplies last. 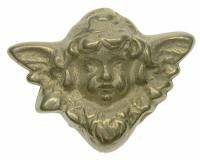 Description: Antiqued brass. 28mm square x 0.9mm thick. Glue to affix. Regularly $3.00/each. While supplies last. Description: Antiqued brass. 33mm convex square x 3.0mm thick. Glue to affix. Regularly $3.00/each. While supplies last. Description: Antique gold swirled leaf design. 4” legs x 2-3/4” tall x 5-1/2” span. 8.mm (5/16”) thick. Regularly $2.50/each. While supplies last. 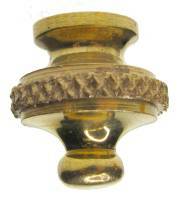 Description: Antiqued brass. 36mm square x 2.5mm thick. Glue to affix. Regularly $3.00/each. While supplies last. 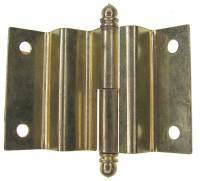 Description: Stamped brass with a striking dark bronze finish. 49mm diameter x 7mm deep. There is a hole to hang it or glue to affix. Regularly $4.00/each. While supplies last. 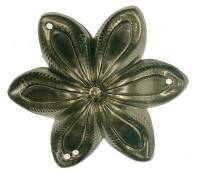 Description: Beautifully detailed convex shaped case rosette is .100” deep. Stamped .032” brass. Glue to affix. Germany. Regularly $3.00/each. While supplies last. Description: For cases, doors, boxes, etc. Regularly $1.50/each. While supplies last. 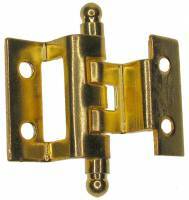 Description: Brass hinge component one left side & one right side. Regularly $3.00/set. While supplies last. Description: Narrow door lock is ideal for grandfather clocks. Fits left or right hand door. Nickel finish. 13/16 inches wide x 2-3/4 inches tall x 5/16" deep. With brass plated key. NOTE: Key style may vary. See No. 23928 for gun metal finished lock. 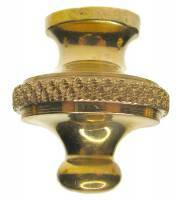 Description: Brass with 3.0mm shaft. 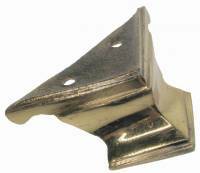 Description: 5-1/8” L x 7/8” W. Cast zinc with brass plating. For floor & wall clocks & other fine furniture. China. Description: 1-1/4" D x 2-1/16" T approx. Brass finish. Length shown does not include mounting screw which is affixed. India. Description: 1-7/8" D x 2-15/16" T approx. Brass finish. Length shown does not include mounting screw which is affixed. India. Description: Reduces glass installation problems in cabinet doors. Prevents breakage. 10 foot roll. 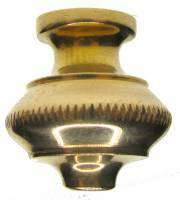 Description: Brass plated pot metal casting. India. 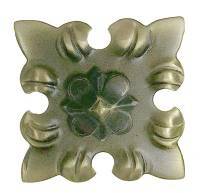 Description: Back cover is 5-1/8” diameter with 5-1/2” center to center mounting dimension. India. Description: 1-7/8” tall x 3-3/4” span with 2-3/4” legs. Antique gold finish. Affix with glue. Special buy. Regularly $2.50/each. While supplies last. Description: 2-3/16” tall x 4-3/4” span. Antique gold finish. Special buy. Regularly $3.00/each. While supplies last. Description: Measures 33mm (1.3”) without the affixed mounting peg. Widest diameter is 20mm (.79”). Mounting peg is 1.6mm (.206”). Combine with others for price break. 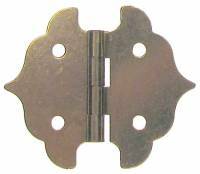 Description: Rectangular brass plated steel movement mounting washer for Hermle movements & others. Top hole is 3.75mm. Side holes are 3.0mm. Germany. Special buy. Regularly $1.50/each. While supplies last.